Ok, this is it for today folks, but this is a fun one! =) Ya ready!? As you all know, I'm a big fan of Sleeping Bear Press books because, well, they deserve to be liked! They produce quality children's literature and the amazing alphabet books which touch on a variety of topics. 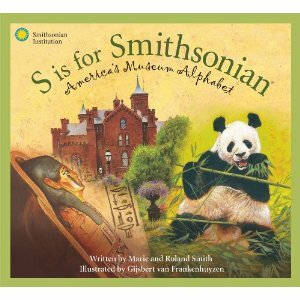 Their latest is S is for Smithsonian: America's Museum Alphabet which I was excited to see as we intend to be visiting this place in the near future. What little girl isn't anxious to catch a glimpse of the First ladies' dresses, or what art enthusiast isn't excited to see George Catlin's paintings? What about seeing the Hope Diamond or the Insect Zoo? This alphabet book walks you through this amazing and historical museum in a fascinating and delightful way - from A to Z. See what I mean? Sleeping Bear Press likes to inform, educate and entertain and I haven't seen a single one of their books which fails to do exactly that! One of you can go browse Sleeping Bear Press catalog and select the title of your choosing to win! That's right - hop on over to the Sleeping Bear Press website and start browsing. Come back here and leave a comment with your selection! I'll draw the winner and you'll win the book you have chosen! Isn't that fun? I love this company and their generosity and I imagine you'll have a bit of a hard time trying to select just ONE book out of the many that they offer. This contest is open to U.S. Residents only and is open through Thursday, April 8th. Ooo! I want this one, too. And can I get an extra entry since Michael's bday is April 23rd? :) Too bad I can't count all of the family birthdays in April since four of my siblings have birthdays this month. I would love to own L is For Lone Star because we are from Texas. I love this series. I have read several of them. I would choose Penny:A Forgotten Coin. Though I am from PA, the PA Reader looks a bit mature. The cookbook from children's classics looks wonderful, too! Oooh, put me down for this one, too! I suppose I'll go for Y Is for Yellowhammer since we're lacking in Alabama books here, but I could pick just about any of them and be completely happy. I would love the S is for Smithsonian book. Oh they all look so good! I'm going with B is for Battle Cry: A Civil War Alphabet. We've been into the Civil war lately around here! I would have to choose one of the hockey ones...like I spy with my little eye, Hockey, or Z is for Zamboni--because my husband plays hockey and my 4 year old daughter loves to play with him!! We posted this at Winning Readings. so many great choices and beautiful books! I would love to win "Little New York"
I would take penny the forgotten coin. My son is obsessed with pennies. Am I rude to enter? If so, take me off, but I am a new fan, since reading the D is for Drinking Gourd Book. And I don't know if I can decide. I think that A Isn't for Fox looks delightful, but maybe too young for Kyle. I think I'd go for Times Square New York Number book. cool!! I love children's picture books. A is for America, that's my pick! I would love M is for Melody (musical alphabet). We already have the hockey ones which were the other ones we really wanted :). V is for Viking: A Minnesota Alphabet. This is fantastic! I had a hard time choosing just one, so went with your suggestion of picking our state. Oh, I'd love "A isn't for Fox." There are so many I'd love to get because, well I love this series. If I had lots of money, I'd be buying all of them. I took your advice and went with the state one..G is for Golden the book about California. Happy Birthday to You would be my choice. It would be good fit for my blog. Thanks for having this giveaway. I didn't realize this company offered so many titles. How do I pick just one?! I guess I'll go with "P is for Pilgrim: A Thanksgiving Alphabet." We're studying American History this fall for 2nd grade and Kindergarten (taking advantage of living in New England for field trips!). Wow! Thanks for such an amazing giveaway! I sure hope I win! I would like to have "D is for Dancing Dragon" My daughter would really like it! I'd pick B is for Big Ben! I used to live in England and I really want to be able to share that! I am a follower - grandson would love it. It really is too hard to choose, but I guess I should pick H is for Hoosier: an Indiana Alphabet. Since that is our (relatively) new state of residence, we should learn more about it.